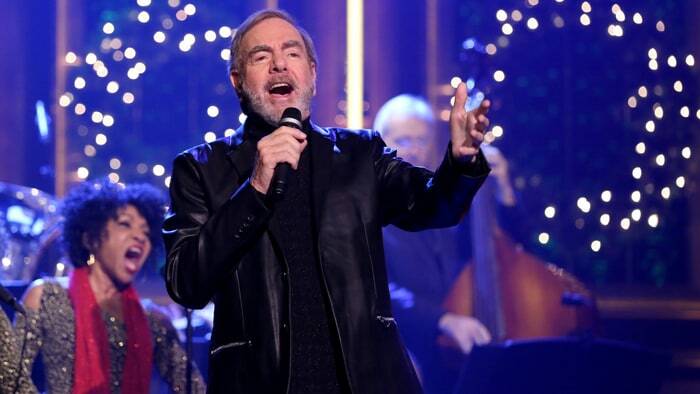 FRESNO, Calif., Dec. 1 (UPI) — Neil Diamond has announced a new 50th Anniversary World Tour with 39 shows set to take place in North America. Neil Diamond took “Song Sung Blue” to the top of the charts, and now he promises to leave “no song unsung” when he takes the stage next year for a world tour. The 75-year-old singer-songwriter promises to play the highlights of his discography on his upcoming 50 Year Anniversary World Tour — including songs he wrote for the 1960s TV rock band The Monkees. “Especially stuff from The Monkees,” Diamond told The Associated Press before taking the stage at the annual lighting of the Christmas tree at Rockefeller Center on Wednesday night. Diamond wrote several songs for the band, including “I’m a Believer,” which has sold more than 10 million copies. Neil Diamond will embark on his 50 Year Anniversary World Tour in 2017, beginning with 39 concerts in North American arenas. Diamond, whose first hit single “Solitary Man” was released in 1966, kicks off the U.S. leg of his world tour on April 7th in Fresno, California. Tickets for the 50 Year Anniversary World Tour go on sale December 9th via Live Nation. “Neil Diamond is more than just a music icon. His singular artistry and talent has left an indelible mark on American culture and has helped shape the sound of popular music for five decades,” Live Nation CEO Michael Rapino said in a statement. After the massive tour announcement and his upcoming seasonal LP Acoustic Christmas, Diamond appeared on The Tonight Show Wednesday to serve as Jimmy Fallon’s partner in a Password showdown against Natalie Portman and J.J. Abrams. Watch the clip below.